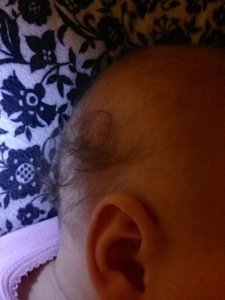 My mom told me that babies’ hair falls out and grows back in differently, and not to get attached to the sweet, sweet curls on Reiden’s head. I just wasn’t prepared for it to happen so fast or so evenly, in a perfectly straight ring around the Larry David. There wasn’t even time for a combover.